The roving is 100 New Zealand Corriedale wool. It is wonderful for needle felting, wet felting, locker hooking, thrumming, spinning and any other wool project where you need great quality wool. 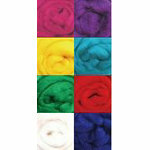 Assortment includes eight 12" pieces of 100 wool roving. Approximately 2oz total Colors: Purple, Magenta, Turquoise, Red, Green, Blue, Natural, Yellow.